Right outside our window, a heartwarming tale of sudden death and evisceration for the holiday season. The other week The Wife was sitting upstairs in the middle of the day in her office doing work, that is, staring fixedly at her computers and droning endlessly into her phones. Her jaw would move up and down and her right hand would make little spastic twitches to move her mouse. Other than that she was, as usual, sitting utterly and completely motionless. The upstairs windows by her desk look out into the upper branches of the gnarly maple tree growing in front of our house. The leaves are gone this time of year, so she amuses herself by looking at this year’s resident squirrel do squirrel business. Watching the squirrel clamber around the branches is about the only exercise she gets when she sits up there. She was gabbling into a phone watching the squirrel when suddenly, faster than the eye could follow, a red-tailed hawk descended from the sky and nailed the poor little tree rat right in it’s own home. Talk about a home invasion. The Wife jumped up from her own office nest flapping her arms and going “Oh! Oh! Oh!” leaving the poor guy on the other end of the phone dangling, grabbed her camera and started snapping pictures of this live drama of nature. Okay, they’re not the best photos in the world. But considering that she snapped them without technical preamble through two panes of glass that have not been properly cleaned in I don’t want to tell you how long... well, they’re not too bad. This is nature, man, you can’t expect perfection. The squirrel did not suffer and die slowly like what happens when a mouse gets caught by your sweet little kitty cat. This hawk was efficient, it was here in our tree to eat and live. Within seconds the hawk had torn open the squirrel’s body and started ripping out bloody chunks with it’s sharp looking beak. 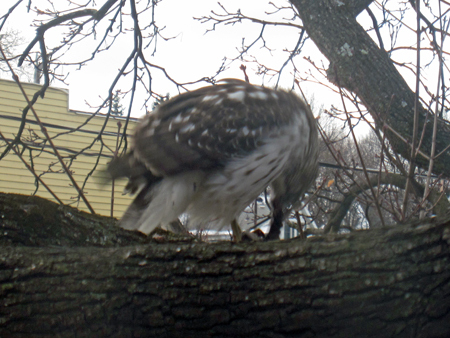 The photos show how the hawk would stand and plunge it’s head into the squirrel’s guts. Then it would lift it’s head high holding a chunk, throw back it’s head and swallow, then pose erect magnificently for a moment as the chunk moved down it’s throat. That is, pose magnificently as only a predator bird can, even a common chicken hawk like this one. I wonder if some of those more awe inspiring patriotic images of bald eagles are actually of the big birds swallowing carrion. 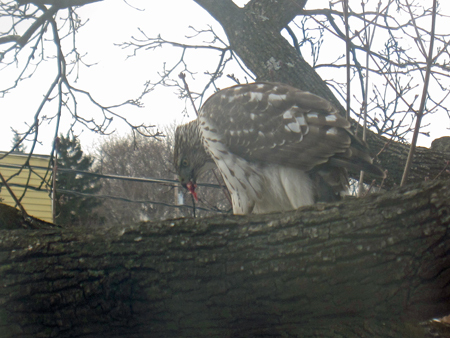 For those of you who right now are now going “Ew, gross,” I’ll have to say I’m so sorry that this hawk does not buy it’s meat prepackaged at the supermarket like you do. For all you vegans out there it’s just unbelievable, isn’t it? And you animal rights people, well, you’d better find that hawk and destroy it because it will kill again. There are lots of squirrels around our house. They are big and healthy, eating very well out of the garbage cans sitting outside of the buildings in my neighborhood. And they are tough, not to be messed with. House cats won’t go near full grown squirrels, and even the crows show them respect. But not tough enough. The urban squirrels in my neighborhood expect to be safe from predators because they live so close to humans. Indeed, our recently departed squirrel made it’s home some 15 feet from our own home and allowed itself be readily visible to us humans. I suspect this doomed critter felt safe and secure and had forgotten that such a horrible monster could swoop down from the sky and strike it dead. That’s rather odd that our late squirrel apparently did not watch for hawks. Perhaps death by flying predator is less of a concern than, say, getting run over by cars or being electrocuted by high wires. . 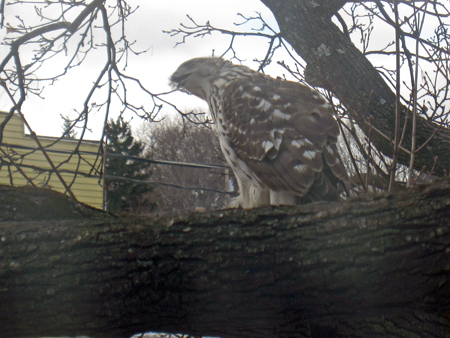 Surely this doomed squirrel was aware that this particular hawk appeared nearby at this particular time. Red tailed hawks, I’ve observed, conduct daily rounds of their chosen territory, visiting the same spots every day at the exact same time. At each of these spots the hawk intently scans the area around the roost for potential meals. They only interrupt their routine to swoop down and kill, but then, from what I’ve seen, after eating they go right back to their routine. Some years ago over on Osborne Street, an elderly neighbor told me about what he called “the four o’clock hawk.” He told me that this particular red tailed hawk landed on the apple tree across from my buildings every day at the exact same time. “You can set your watch by it,” he said. Sure enough, I discovered that the hawk appeared at the apple tree every single day at exactly 3:56. 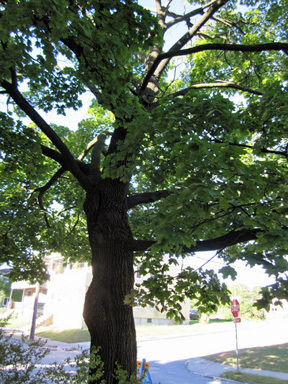 At exactly 3:59 it would fly over the roofs of my buildings and settle into the maple tree in the back yard. Then at 4:02 it would move out of sight into the trees below Delaware Street. I saw it do this for about three years. When the four o’clock hawk arrived, all of the sparrows in the back yard would hide in the brush, and every single one of them would scream. I noted that the sparrows would prepare for the hawk’s arrival a few minutes beforehand and most were already perched in the brush and already screaming when the hawk landed in the maple. They cared about nothing but the deadly hawk above them. Once in the back yard at 3:59 I watched a crowd of sparrows scream and thrash inside an overgrown rose bush while the hawk watched, waiting for an opportunity. The little birds paid absolutely no attention to the elderly neighbor’s house cat, who very casually strolled into the rose bush and snatched a sparrow in it’s mouth. Just as casually it carried the screaming bird out in the open to play with it, as cats do. Well, the sparrow played dead, which was no fun, so the cat dropped it onto the ground to examine it. With a flutter and a cry the sparrow made it’s escape, leaving the cat sitting looking startled and very, very pissed. I swear “Kitty” (it’s name) sat thumping his tail angrily for about ten minutes. I guess the sparrows figure they can deal with these dumb overfed house cats. But the hawks don’t fool around, you don’t ignore them. Didn’t our squirrel know that? I’ve read that most birds have fear of predator birds hardwired into their bodies, maybe the squirrel was too smart for that. But no, us “higher mammals” have fear hardwired into our mighty nervous systems. While I was living in San Francisco I read a story in the paper about the big indoor monkey enclosure at the SF Zoo, which is home to a troop of, I think, macaque monkeys. The enclosure is so big that the troop can actually migrate around a big hill in the middle. Well, some rich lady donated to the zoo a very realistic life sized statue of a python climbing a tree branch, which the zoo officials decided would look good as a decoration in the observation area of the monkey enclosure. The monkeys, who had not seen a python in at least eight generations, screamed and took evasive action... just like the sparrows on Osborne Street. The monkeys didn’t calm down until the damn statue was removed. The Wife is terrified of snakes. There is no rational reason for her fear, not even a childhood trauma. 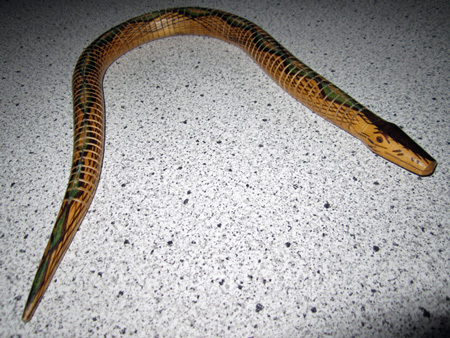 I’m convinced that her fear is hardwired into her, although her immediate ancestors had no particular fear of snakes. It’s really a puzzle to me. For example, years ago I encouraged her to overcome her fear of dogs, which was more about unfamiliarity with the scary barking creatures. Today she regularly meets and greets dogs being walked by their owners when she goes running early mornings in Lincoln Park. But if she happens to see a harmless little garter snake sunning itself on the walkway, she screams in horror and sprints away astoundingly fast, faster than she can normally run. Over the years I have patiently tried to help her work through her fears by chasing her around the house with a toy snake and scaring the living bejeezus out of her. Yeah, psychiatry is so much fun. But to this day, like the San Francisco monkeys, she can barely stand to be in the same room as a snake locked safely inside a terrarium. She won’t get close enough to overcome the unfamiliarity. So all sorts of creatures are hardwired to fear predators. Even advanced super monkeys who can use computers and talk on the phone have this characteristic. But I guess if we didn’t have complacent squirrels who don’t bother to hide from danger, then the hawks would get nothing to eat. 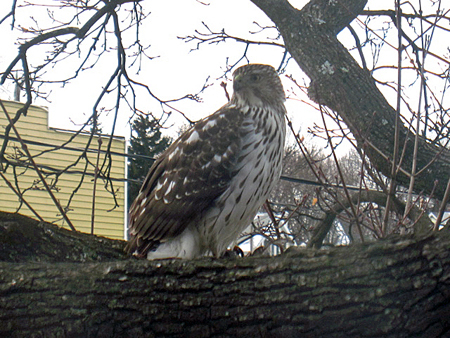 Way back in the 20th Century when us Baby Boomers were kids, there were no hawks anywhere in the Hudson Valley, period. This was because of the widespread use of the toxin DDT as a bug killer. For a long time DDT worked great on bugs, the problem was that it eventually killed everything else too. Including humans. DDT adversely affected predator birds at the top of the food chain in a number of ways, but most critically the poison ruined their ability to reproduce. Hawks were virtually extinct when I was a kid and i never saw one until I was well into adulthood. Now because DDT is banned, some species of hawks such as the red tailed have become common. The successful elimination of DDT brought back the hawks, but of course there was a years long fight between America one one side and poison manufacturers on the other. We Americans managed to win this battle partly because it started to become evident that DDT no longer killed bugs but it continued to kill humans. If we were trying to ban DDT today we would have to contend with an intense corporate media blitz by the foreign based poison makers, while a tiny but overly loud army of Teabagger Dittoheads would proclaim against this latest Liberal Conspiracy. Today the biggest toxic threat to predator birds at the top of the food chain comes from anticoagulant poisons such as warfarin and brodifacoum, which are the active ingredients in common mouse poisons sold in the supermarket. They work great getting rid of mice, and I confess that I use this stuff regularly when mice take up residence in my buildings. The mice eat the poison then they disappear, a much more effective method than setting messy traps. These poisons work by depriving the mouse’s body of vitamin K, which is essential for a functioning nervous system. The problem is that predators such as cats, dogs and hawks eat the half dead mice and accumulate the poison. The standard treatment for healthy dogs that go into sudden convulsions is to give them a massive dose of vitamin K, which I’m told usually works instantly. 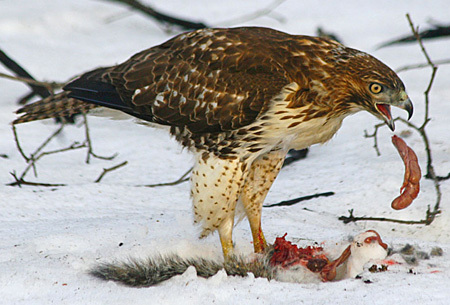 The occasional poisoned mouse found near a residence is hardly a threat to overall hawk survival. The real problem comes from massive applications of these poisons around garbage processing sites. Anticoagulants are spread daily all around the Waste Management garbage sorting facility here in the Port of Albany, and of course these poisons are spread by the ton all over the Jerry Jennings Memorial Dump out on Rapp Road. These giant piles of garbage on either end of the City of Albany attract animals of all kinds, both prey and predators. The poisons are meant to repel the creatures, especially rats. But as far as I know, so far the authorities have carefully resisted doing a study of how these poisoned rodents affect hawks and other predators who depend on rodents for food. Well, I hope this story of death and dismemberment in a tree brightens up your holiday season. I know it brightened up mine. Most people that I’ve encountered these past few weeks seem to have been actively avoiding Christmas and The Holidays. Perhaps that’s because our current economy is the worst since the 1980s. I distinctly recall how just before the depressed Christmas of 1987 the malls were shockingly empty of shoppers. Everything was on sale and the sales persons all looked shell-shocked. Today all of us are experiencing the logical result of applying three decades of Supply Side Trickle Down corporate ideology against our nation. Our jobs have been deported and our means of creating wealth have been suppressed. Instead, our elected “leaders” are enthusiastically paying protection money to foreign corporations, hoping that the elites who control those corporations will provide us with a few low paying jobs. That’s corporate socialism. It’s hard to celebrate a holiday of plenitude like Christmas when there ain’t much plenitude to go around. 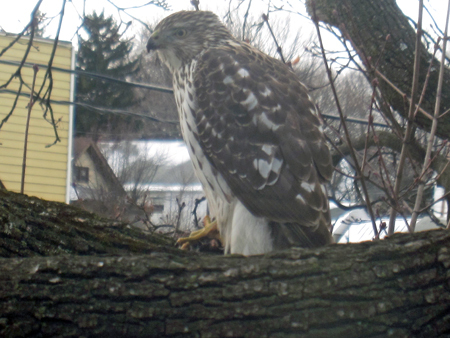 The hawk who ate our squirrel, however, appeared satisfied with the economy. Can we say the same about the squirrel? sometimes we're the hawk; sometimes we're the poor squirrel, deluded by the good times; and sometimes we're the sparow, fakin' it to try to get out of the way.